It was easy to appreciate why Trkulja’s “Tradimodern” music is at the forefront of the Serbian-Balkan scene as the group shifted effortlessly between pieces led by strong harmonic voices, goat-skinned bagpipes, wooden flutes, saxophone, clarinet and Armenian duduk. In the course of crystallizing it’s musical identity, Balkanopolis has sketched out the contours of a novel musical movement that could be thought of as “modern tradition”. On a worldwide scale, a majority of traditional cultures, especially as practiced through faithbased customs and rituals where song and dance play a leading role, are becoming ever increasingly marginalized by the modern way of life. Traditional music of Serbia and the Balkans has undergone a similar fate. Balkanopolis strives to revive authentic traditional music from Serbia by welding the traditional: authentic instruments (gajde, frula, kaval, tambura, tapan), melodies and rhythms (national kolos, uneven rhythms, Serbian traditional songs) as well as existing and developed improvisations characteristic of Serbian music and the modern: modern instruments, arrangements and manners of performance. The result is “modern tradition”, a seamless blending of the traditional and modern into a unique sound that transcends the mere aggregation of its inputs. Since founding the ensemble Balkanopolis in 1997, Slobodan Trkulja introduced Serbian traditional instruments such as gajde, (bagpipes), kaval (endblown flute), frula, tambura, to name a few, to classical music, playing his compositions with symphonic, philharmonic as well as pop jazz orchestras. His style of playing jazz standards in Balkan irregular rhythms (11/8, 7/8) furious solos over modern and progressive jazz harmony and traditional rhythms of Serbia and the Balkans was noted at European jazz festivals, such as the North Sea Jazz and Erasmus, winning Slobodan numerous awards and accolades. Slobodan is one of very few musicians who is equally versatile in both musical worlds. Slobodan’s gift for music (plays more than 15 instruments and has a unique voice that has been described by music critics as “one of the most beautiful voices of the Balkans” NRC Netherlands ) was the impetus and enabler for merging of modern and traditional music into a new form, a sub genre which due to its polarity needed two words to define – “modern tradition”. Slobodan grew up weaned on Serbian epic poetry and the lyrics he writes have fully taken on metaphors & personifications used in traditional Serbian poems such as “Girl as blush as a golden apple” or “lining morning dew as pearls for a necklace”. 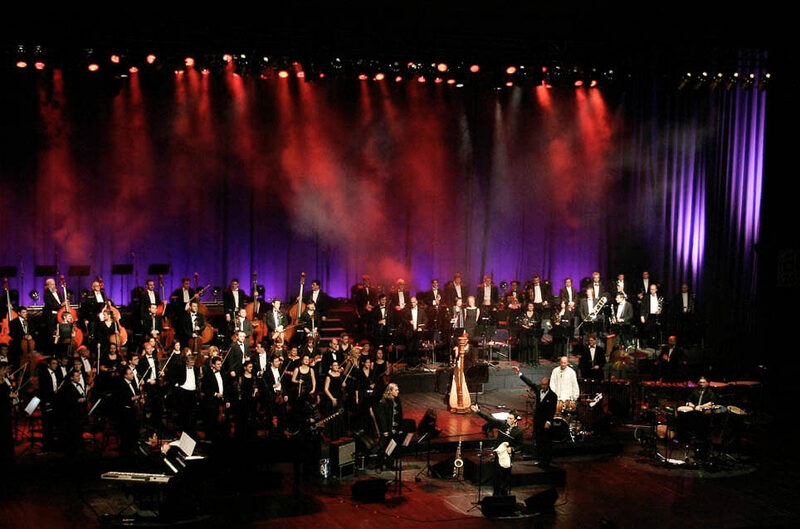 He uses motifs from rain invoking rituals, where songs are used to influence the forces of nature as evident in the symphonic rock orientated song “Rain”. This is just one of many motifs that Trkulja uses in his compositions, making connections between ancient, traditional music expressions and putting them into modern pop context by using contemporary form, colors of classical string ensembles,rock guitars, and traditional Serbian and Balkan instruments as a leading sound. Another component in the synthesis between the traditional and modern world is Slobodan’s unique way of singing. He is both a traditional and pop singer, equally adept in both worlds. Slobodan’s agile voice that was formed by traditional singing idioms (so called grleno pevanye, throat singing) earned him a title of “Male version of Mystére de la Voix Bulgaire” (Balkan Insight) whilst at the same time he sings with an energy of a pop star, able to belt out tunes and go head to head with the best of them. His voice is almost a personification of modern tradition, defined by his ability to walk, or better yet dance on that fine line between these two worlds. The way he sings about “fairy of the hills that has taken his heart” in his melancholic ballad “Goro Moja” sets you in the Balkan epic fantasy world resembling J.R.R Tolkien. You can almost witness the glances exchanged between a boy and a girl during an encounter on “Moba”, the traditional harvest gathering in Serbia. Recently, Slobodan started exploring guitar sound effects and textures on bagpipes. One of the sounds he presented during Arena concert was gajde with wahwah pedal and distortion, paying respects to Jimi Hendrix in his approach to articulating gajde sound.